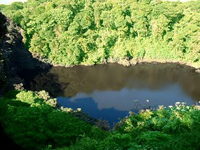 If you want to see a volcano that will not have many other tourist around and feel like you are on a Costa Rica private tour even with your own volcano than this is the place to visit. To arrive to Barva you will drive through the town of Heredia and from their it is about a 30 minute drive up the mountain. You pass through some rural mountain towns on your way to the top of the volcano. To visit this volcano will involve some easy hiking. You will be surrounded by lush cloudforest for the day which is not a bad way to spend a morning during your Costa Rica vacation. The top of the Barva volcano is 9500 feet above sea level. Barva is dormant. However, you can see thirteen eruptive cones. Some are filled with lakes. The area has a beautiful 185 square mile park which serves as a watershed for San Jose, the capital. The park has some of the roughest terrain in the country.The rainforest cover has hard rains that dump a large amount of water in a short period of time. A great variety of wildlife live here. There are 135 species of mammals and 500 species of birds. The hiking around the summit of the volcano is well worth the effort. Another interesting fact is that our offices of Costa Rican Resource are located on the slopes of the Barva Volcano near the town of Barva, Heredia. We hope you would stop by and visit us as we would love to introduce you to the staff that might have planned your Costa Rica family adventure tour.